OSPF is an interior gateway routing protocol. Specifically it is a link-state routing protocol, it runs the Dijkstra SPF Algorithm. Is a classless protocol that supports VLSM and summarization. OSPF guarantees a loop free topology. All routers in an area should have the same OSPF database thus OSPF guarantees a loop free topology. OSPF’s metric is cost which is a direct relationship to the bandwidth. Normally they just find eachother via this default multicast config. • Router-id which is used to identify the node in the graph of the link state. Then once adjacency is negotiated we exchange the LSDB. Each router’s LSAs include a “cost” attribute for each link, the lowest end to end cost is the best path. Cisco’s implementation and most implementations of OSPF use bandwidth to compute cost, however the RFC says use whatever you want, just agree on it. Routers never advertise their reference-bandwidth thus it is important that you manually configure it correctly on all of them, a mismatch will not cause neighbor issues but will cause sub-optimal routing. Use BFD when you can or OSPF fast hellos for faster recovery. Linkstate requests and link state updates are sent out. All LSAs are acknowledged. Once LSA download is complete we move on. Neighbors are fully adjacent and databases are synchronized. Full is the normal state any other state is a problem except for 2 way which is normal on broadcast networks. 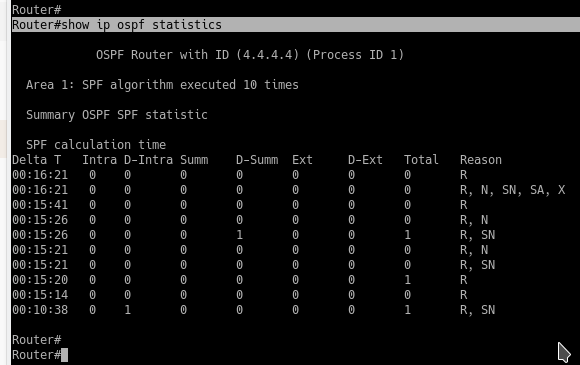 OSPF refreshes the database every 30 min if its the same, we dont recalculate SPF. LSAs that reach the MaxAge of 60 min then it is withdrawn via reflooding via setting the age to be 60 to force the route to disappear. OSPF behaves like a distance vector protocol between areas. The router-id is a 32 bit number that is just an ID for the NODE in the OSPF graph. It is just a 32 bit number that happens to come from an IP address. Router-id which is used to identify the node in the graph of the link state. If you are running multiple OSPF processes, they must have different router IDs. Each OSPF process performs the same steps above, they just skip the one already in use. 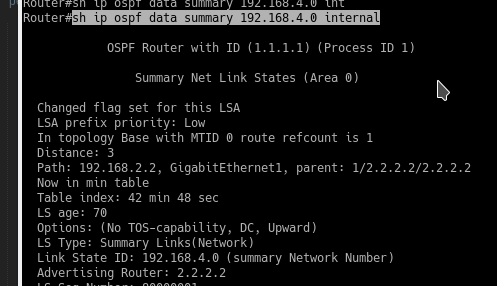 The OSPF router-id chosen does not need to be advertised or reachable via the routing table. Routers re-run the RID election when the ospf process is restarted. If a router ID changes then the SPF calculation will need to be run as it looks like a new router to the other routers in the area. What is recommended? Always set the router-id manually. Note that when enabling OSPF via the network statement, you are not inputting the network to advertise. OSPF will use the network from the interfaces that matched the network statement. Regarding OSPF network statements, the most specific network statement wins. For example the second statement below will be the “winner”. If you are enabling OSPF via the interface statement and the interface also has a secondary Ip address, you are by default advertising that network as well int OSPF. This can easily be disabled. Enabling OSPF via the interface is convenient because if the interface changes, OSPF will still advertise the link. The area id can be inputted in decimal or dotted decimal, it doesnt matter because the router reads it in binary. What does the sequence tell us in the following output? The sequence in the ospf database tells us the revision or version of this LSA. This should match on all routers in the area and thus will mean they all have the same copy of this LSA. In the above screenshot notice that we have 4 neighbors, but 2 of them don’t actually form a adjacency, they are just there. This is because these 2way/drother routers are not DR nor BDR, and we get all of their information from the DR thus we don’t need a adjacency with them. We stay in the 2 way state with them, that means in the hello packets we acknowledge we have seen their hellos. Why do we do this? OSPF does this to avoid sending redundant LSAs into the network. In conclusion an OSPF router only forms an adjacency with a DR and BDR and not other routers. On a multiaccess network, a designated and backup designated router are chosen to handle the LSA flooding. This is most useful during the initial LSA DB sync, however actually becomes non optimal if we are just maintaining the database. Now let’s discuss how routers interact with the DR and BDR. Routers can only exchange LSAs if they are in the full state, and on a multiaccess network, routers only go into the full state with the DR and BDR. When a router needs to send an LSU to the DR and BDR, it does so by sending to the multicast address of 224.0.0.6. The DR then floods the LSA out to all routers by sending to the multicast address of 224.0.0.5. On networks without a DR and BDR the LSUs just go to the all OSPF routers multicast address of 224.0.0.5. On a multiaccess network a router can be one of 3 things: a DR, BDR, or DRother. Also, on a multiaccess network like Ethernet, OSPF routers can either be neighbors, or adjacent. We are neighbors with DRothers, but are adjacent with the DR and BDR. With adjacent neighbors we have fully exchanged LSDBs. Highest priority wins the DR/BDR election, a priority of 0 means it will not be considered in the election. The same election then happens for the BDR. If the priorities match, then the highest router-id wins, and this will never match. If a new router comes on the LAN with a better priority, it cannot take over, a failure must happen and then the BDR will move to be DR, and a BDR spot will open up. If routers disagree on who the DR and BDR is, then a DR and BDR election happens (think of a spanning-tree event causing isolation for a set period). So how do we manually configure priority for a router? Note changing the priority does not cause a re-election. Interface type | use DR/BDR? | default hello | requires neighbor command? | more than 2 hosts allowed ? What is the purpose of the following configuration? A neighbor priority is NOT the same thing as OSPF priority. 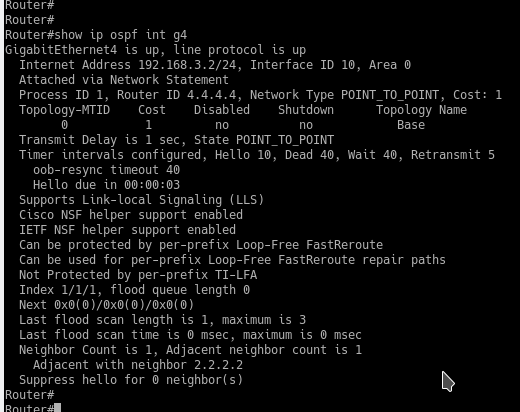 A neighbor priority indicates who will be contacted FIRST by our OSPF process. It is a way for us to show preference to neighbors. If there are multiple neighbor commands, and at least 1 has priority specified, the neighbor with priority will be contacted first, and will get to do the DR/BDR election first. What are the 2 steady state operations for maintaining OSPF? All areas must connect back to area 0. What is another name for area 0 ? The backbone area. A router that links to different areas is called an Area Border Router (ABR), it must have one link to area 0. A router that injects or redistributes routers is known as an autonomous system boundary router (ASBR). An ABR keeps a separate link state database PER area. An ABR will run a separate SPF calculation per LSDB. What 4 benefits do OSPF areas provide? Areas in OSPF add hierarchy and scalability. An area is also a flooding domain. All devices in the area have the same LSDB and agree on the topology. The routing bit is a custom Cisco implementation which let’s us know if the LSA will be used in the SPF calculation. Pay attention to the “in topology base with MTID” this means the LSA is good and installed in the RIB. This is in contrast to having the routing bit NOT set, meaning the router is not reachable. The routing bit is a locally significant feature and is not actually sent with the LSA. Thus just seeing an LSA in the LSDB does not guarantee that the prefixes are reachable. Here we see a good summary LSA which says “in topology base” meaning it passes all of the LSA checks. 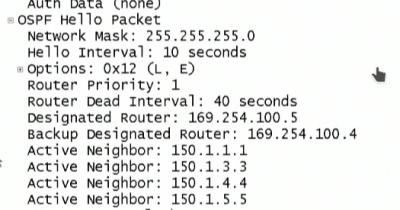 How do we determine our neighbors OSPF priority? How do we determine our OSPF priority on g1? Sometimes it can be scary to run a debug on a production device because we may kill the CPU due to too many messages and lock ourselves out. OSPF provides a means to increase the logging for the neighbor/adjacency state machine so we can better troubleshoot it. 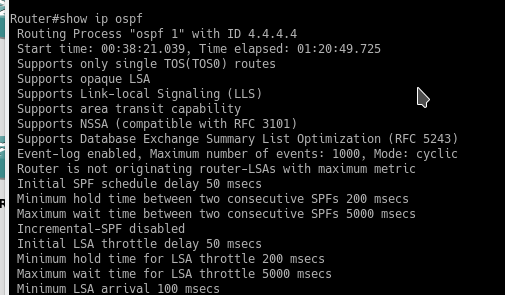 Now if we clear the OSPF process we can see a more detailed output in the log messages. How can we force OSPF to re-run SPF? note that in the above example I have “debug IP ospf monitor” on.